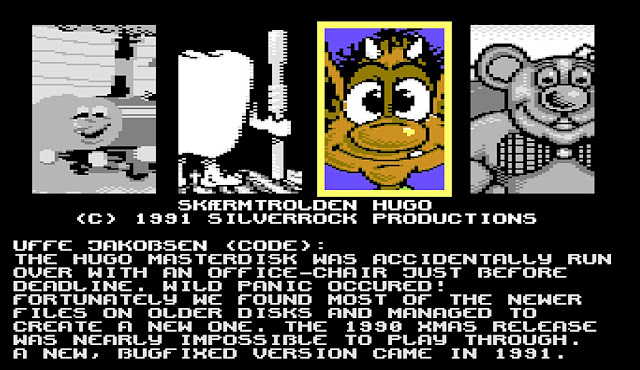 Indie Retro News: Silverrock Collection - A great easyflash release on the C64 featuring Hugo! Silverrock Collection - A great easyflash release on the C64 featuring Hugo! Many of you are probably still playing through the newly released preview of Galencia on the C64, but there's another special release that has recently appeared today and that's the Silverrock Collection released by SNAQZ. This easyflash cartridge bonanza took us completely by surprise as it's a tribute to some of the coolest and strangest games that have come from a company well known for putting games on the tv! And that company is none other than SilverRock Productions, a Copenhagen-based Danish company founded in 1988 (renamed to ITE in 1992 ), that developed and released games such as the ones on this easy flash release, Hugo, Guldkorn Expressen, Harald Hårdtand and even Super Oswald. Although in my childhood memories, the one that stands out the most just has to be Hugo, a friendly, small Scandinavian folklore troll fighting against evil, often to save his family, which in the UK made its appearance on the TV show What's Up Doc? !